10 July 2016, Sunday. I collected my repaired Pulsar 200NS yesterday, and I’m itching to go riding again. But since the engine was newly rebuilt, I had to run it in like how one would on a brand new engine – keeping RPM’s below 5,000 for the first 500km or so, and speeds below 80kmh. 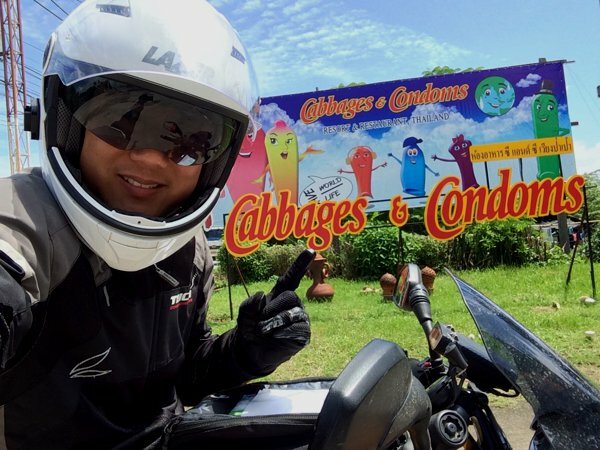 sgBikerBoy 2016 Trip, Day 20. 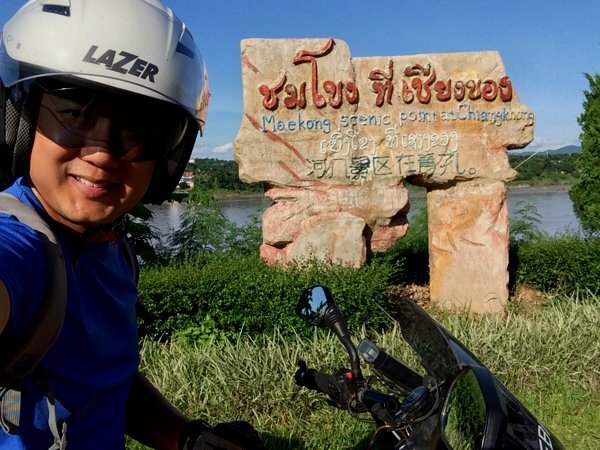 Chiang Mai to Chiang Khong. 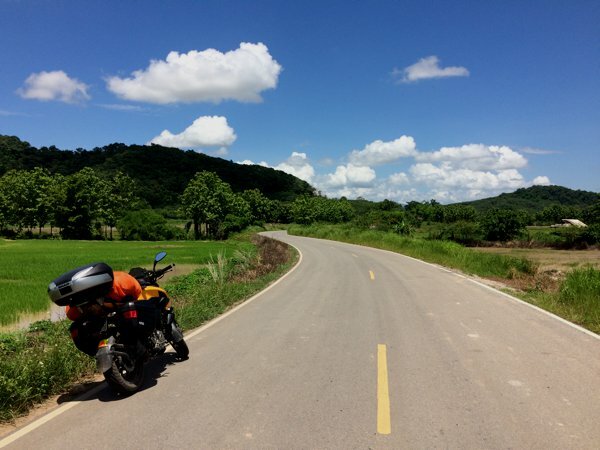 The ride between Chiang Mai and Chiang Khong was one of contradiction. It was a dichotomy between the most agonising ride and the most pleasurable ride on my Bajaj Pulsar 200NS. The 300km ride was estimated to take 4.5hrs, going through some highways and some minor roads. But because I had a newly rebuilt engine, I was trotting along at speeds of 60 to 80kmh – keeping RPM’s below 5,000 for the piston rings to sit properly and valves to seal. The new engine was silky smooth and ready to roar, but I had to hold back on all that potential power. But negotiating every corner now puts a smile on my face as the jerkiness and engine sputter I was so used to is now completely gone. 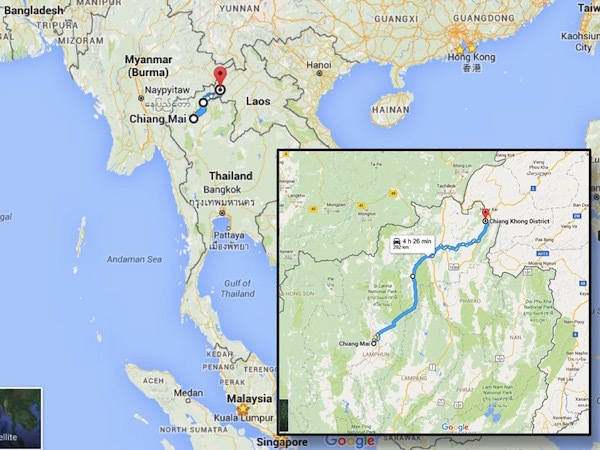 Getting from Chiang Mai to Chiang Khong would mean passing Chiang Rai. Again. So some of the sights were very familiar to me as this would be the third time I’m passing them in 4 days. 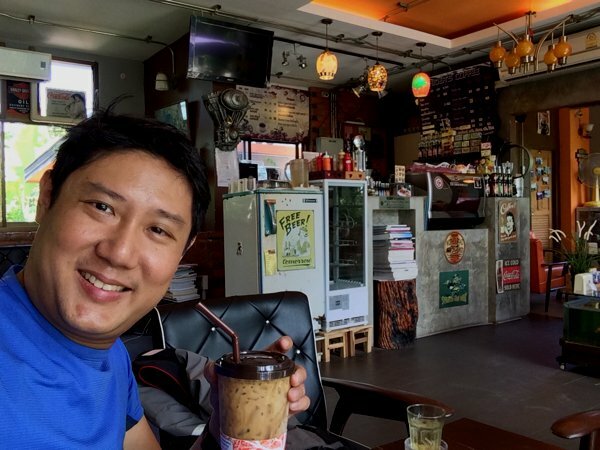 I did Chiang Mai to Chiang Rai and back just a couple of days ago. Anyway, every experience is new, yah? I remembered a highway rest stop called “Coffee View”. So when I passed it, I made a u-turn (it was on the other side of the highway) and stopped for a coffee break and some amazing views. 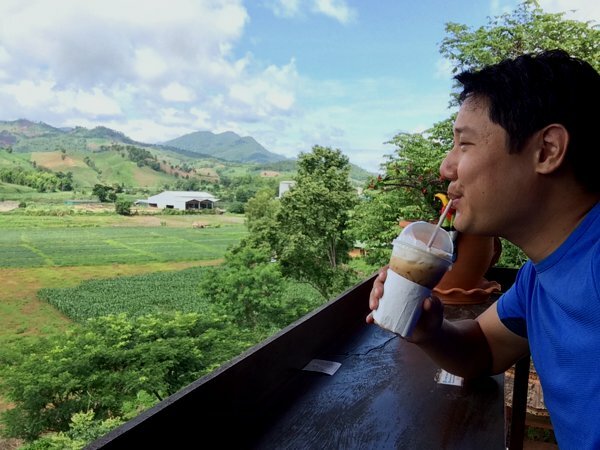 The view at Coffee View. sgBikerBoy savouring a cup of iced coffee while enjoying the view at Coffee View. 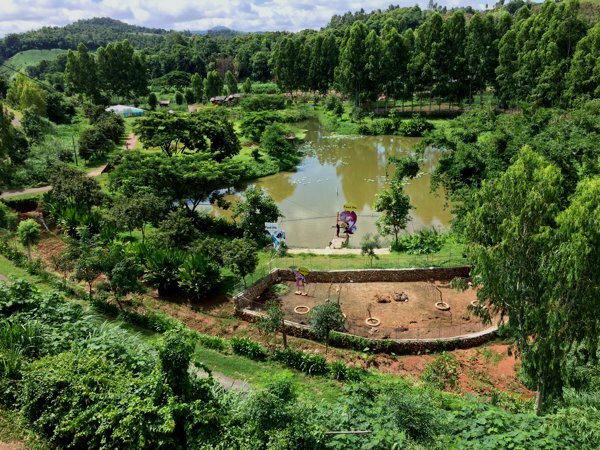 Coffee View has a resort accommodation and a farm of fish, rabbits and (I believe) ducks for kids and over-aged kids to pet and play. 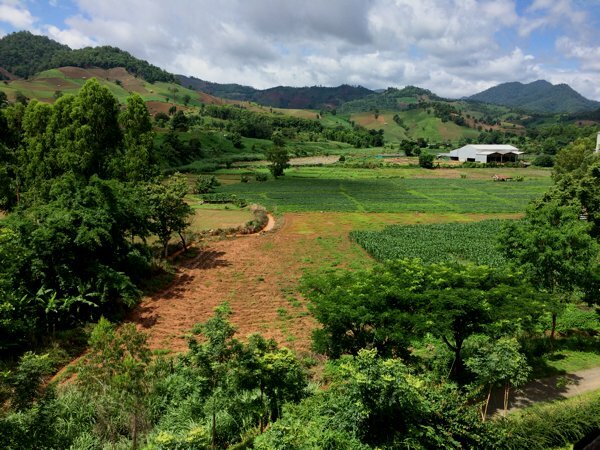 Some amazing scenery in northern Thailand. The Bajaj Pulsar 200NS feeling lonely on this road with very light traffic. I was standing in the middle of the road to take this pic. No scared. No cars. 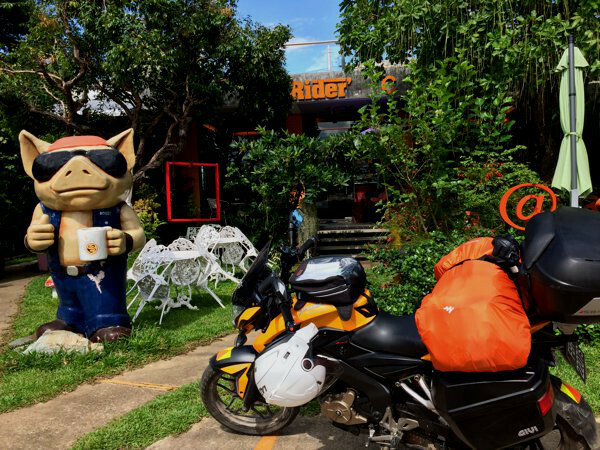 I arrived Chiang Khong in the late afternoon and had lunch at Rider’s Cafe. Enjoying my second cup of iced coffee today. Caffeine power! Lunch. 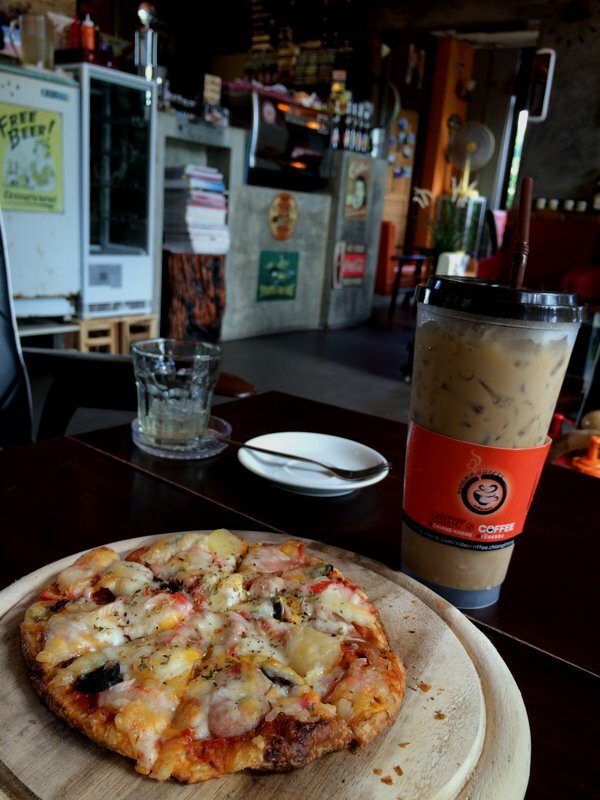 Pizza and iced-coffee at Rider’s Cafe. They were playing english music in the cafe! 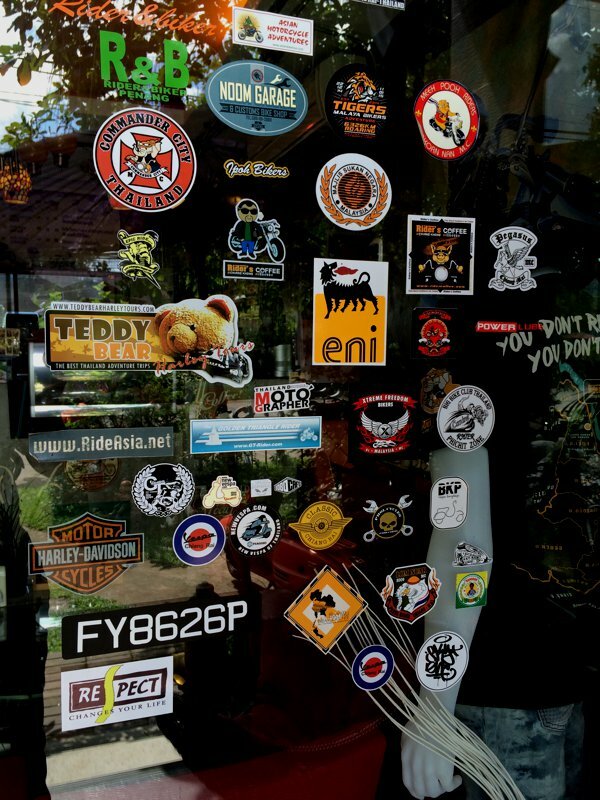 Saw this at the glass entrance of Rider’s Cafe. FY8626P, whoever you are, you’ve left your mark in northern Thailand! For the non-Singaporean readers, that’s a Singapore-registered bike plate. 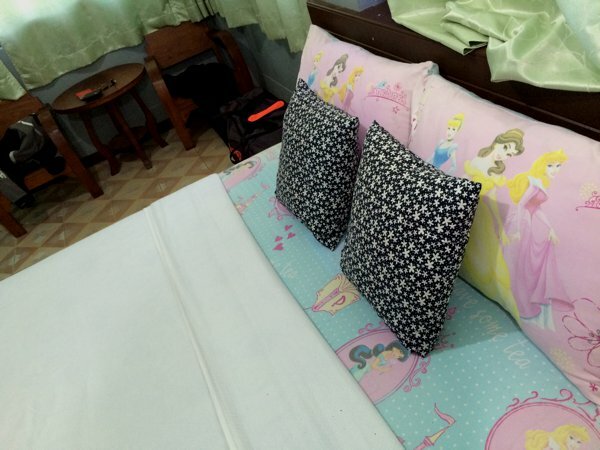 I checked into a small hotel overseeing the Mekong River. I can actually see Laos just across the river. This hotel has some interesting bed sheet choices. Scenic point at Chiang Khong of the Mekong River. See that land on the far bank of the river? That’s Laos. Remember to change engine oil after 1000 km run in. I intend to change it once at 500km, 2,000km, then at 5,000km. By then, the final oil change should be enough to bring me home. 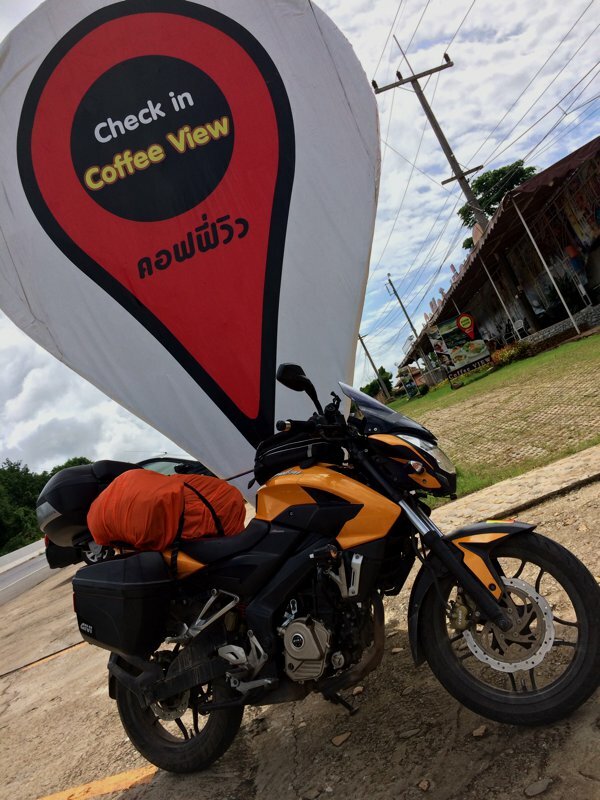 Now I have a problem – I can’t seem to find weight 50 4T oil around here in the smaller towns of Thailand. They typically use weight 30 and weight 40 oils. I know the W40 probably won’t kill the engine, but I’m generally fussy about what I put into the engine and the Bajaj manual calls for W50. SAE40 should be fine, w50 is thicker and now your engine is new, tolerance should be tighter. didn’t know that Baja use w50, i thought only harley use that. think you have to use ‘lorry’ oil to reach w50. see you back in sillypore or I may zoom up to meet you around krabi/hatyai when u come back. 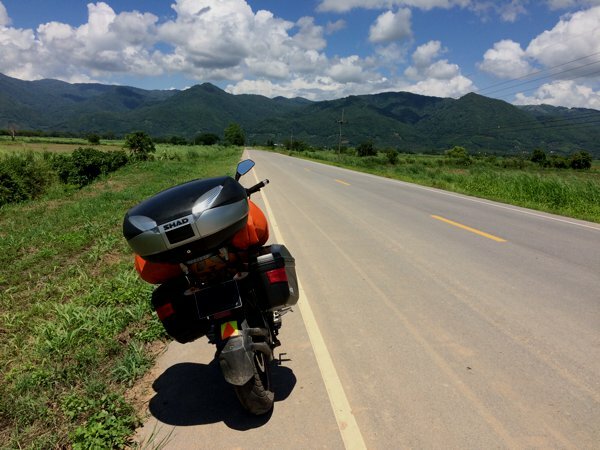 I presume You ve not done the hatyai -yala – betong loop. I just done the betong – grik-royal belum-jeli-tasik kenyir-terrenganu-kuantan during hari raya, still can’t seem to get my mind off the scenic ride yet. http://hatyaiongn.blogspot.sg/ ………………my blog in 2012. Nope. I zipped passed HatYai to get to Chiang Mai. I figured I’d be very fresh at the start of the trip and tried to head as north as quickly as possible, and then take my time to head back south.